This website makes it possible to see how the political scientist Masao Maruyama arranged the books in his home library. Maruyama’s collection of books was donated to Tokyo Woman’s Christian University in September 1998. Based on the belief that the arrangement of the books was itself a reflection of Maruyama’s intellectual concerns, we have aimed as far as possible to keep the arrangement Maruyama maintained at home. Therefore, rather than following standard library classification practices, the Masao Maruyama Collection in the Tokyo Woman’s Christian University Library is shelved as the books were found in Maruyama's house. Books with annotations by Maruyama and others in fragile condition, however, are stored in closed stacks; in this regard it is no longer possible to see the exact state of Maruyama’s home library at a glance. The Virtual Tour of Masao Maruyama’s Home Library allows visitors to see the bookshelves as they stood, and in so doing to gain a glimpse of his intellectual life. This website is funded by MEXT-Supported Program for the Strategic Research Foundation at Private Universities, 2012-2016. ©The Asahi Shimbun CompanyMasao Maruyama (1914–1996) was a 20th-century Japanese scholar and thinker of international acclaim. His father, Kanji Maruyama, was among prewar Japan’s leading political journalists, his friend, Nyozekan Hasegawa, had a significant impact on Maruyama’s thought. Maruyama was a member of the Japan Academy, and Emeritus Professor at The University of Tokyo, and was also awarded honorary doctorates from Harvard University and Princeton University. His major published works, Nihon Seiji Shisoshi Kenkyu (Studies in the Intellectual History of Tokugawa Japan) and Gendai Seiji no Shiso to Kodo (Thought and Behavior in Modern Japanese Politics), have been translated into multiple languages, and enjoy global readerships. Another celebrated work, Nihon no Shiso, is one of the longest-selling titles in the publisher Iwanami Shoten’s Iwanami Shinsho series. Masao Maruyama chose to study the history of Japanese political thought on the recommendation of Shigeru Nanbara. By demonstrating that modern thought took shape in Tokugawa Japan, he contributed significantly to the establishment of the field of Japanese intellectual history. Based on his own experience of arrest and detention under the Peace Preservation Law (Chian Iji Ho) and military life as a rank-and-file soldier, Maruyama analyzed the Japanese mentality under the emperor system (tenno-sei-teki seishin kozo) and elucidated the mechanisms of “the transfer of oppression (yokuatsu ijo)” and “the system of irresponsibility (musekinin no taikei) .” Through his studies of Yukichi Fukuzawa, Maruyama also illustrated the relevance of the Meiji Restoration to present-day society, and emphasized the necessity of a civil society based on voluntary associations and what he called spiritual aristocratism (seishin-teki kizoku shugi). Accompanying these arguments were his insistence on democracy as a permanent revolution, and his identification of the atomization of individuals and homogenization as the pitfalls of popular democracy in postwar mass society. 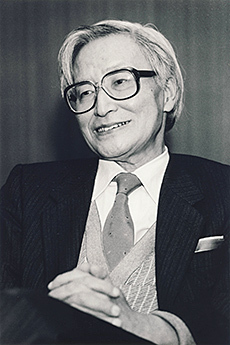 During the U.S.-Soviet Cold War, Masao Maruyama championed the significance of Article 9 of the Japanese Constitution from the perspective of political realism, and explored possible ways of restructuring the international order. Copyright © Tokyo Woman's Christian University.